Vanessa Lujan is the property manager at Polson Landing Apartments. POLSON — Polson’s newest housing development is open for business. 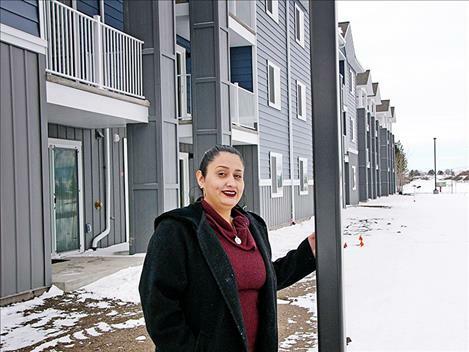 Polson Landing Apartments opened Dec. 22, property manager Vanessa Lujan said. The affordable-housing development, which is located on Ridgewater Drive next to the city’s new soccer fields across from Mission Valley Aquatic Center, has 35 units. Twenty-one have already been rented, she said, including one for herself. The income-restricted development, which was funded in part by $6 million in tax credits from the Montana Board of Housing, has one, two and three-bedroom apartments, although the three one-bedroom units are already leased. Three three-story buildings are on site and each has 12 units, Lujan said. The development includes a community room for rent at the leasing office that includes two tables and chairs, two couches and a kitchen. Infinity Management & Investments LLC of Lewiston, Idaho, which is managing the property for the owner, Alex Burkhalter and Housing Solutions of Missoula, plans to build a park on site this summer, Lujan said. Rental rates are based on family size and income and one must have a job, be on disability or receive student loans, to be eligible. Maximum annual incomes range from $29,040 for a two-person household, $32,700 for a three-person household and $36,300 for a four-person household. The amount of subsidy for each apartment ranges from 49 to 80 percent, Lujan said. The rent for two-bedroom units range from $460 to $725 a month while three-bedroom units go from $535 to $795. Amenities include a washer and dryer in each unit along with a dishwasher and patio or balcony, for example. Lake County Community Housing is a special general partner on the project, and Mountain Plains Equity Group of Billings is a limited partner. The Polson Landing leasing office is open from 9 a.m. to 5 p.m. The phone number is 406-883-0556.